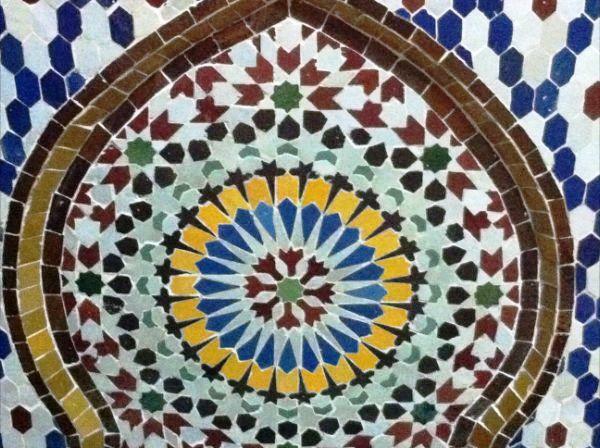 Moroccan Mosaic or the art of making Zellige is transmitted from generation to generation by master craftsmen. Training starts from a very young age to master a difficult and unique skill of making Islamic tile mosaics. In fact, diligent attention to detail is crucial in the process of creating them. Only recently, have scholars within the fields of mathematics, engineering and computer science begun to figure out the mathematical reflection behind the patterns and designs of zellige. The best examples of this art can be found in Morocco of course. It all started in the 11th century, when Moroccan artisans starting creating their own mosaics inspired by the Roman ones. Simple, with earthly shades, the colors soon went more modern with an addition of reds, yellows, greens, blues, turquoise and rose to their palette over the centuries. Yet, unlike Roman mosaic, Moroccan mosaic patterns and designs are abstract since Islamic art avoids picturing living things. After being commissioned by a client who specifies the location of the mosaic, and after deciding on a design, the artisan calculates the size and number of tiles needed. He then places an order with a potter who will make the tiles with a special type of clay. His clay compound includes recycled lead from battery acid mixed with water and pigments to make the glaze. After baking the tiles several times, a cutter breaks them into the different forms required before giving them to a finisher who smoothes out the edges and makes sure the tiles will sit together correctly once the cement is applied. Finally, a layout artist puts it all together in the specified location. Before he lays the tiles' glazed side down, the artist draws the artisan’s design on the floor. This is due to the fact that there is no way to check the colors, so he needs to make sure to get everything right the first time. When finished, the mosaic is fixed to the wall with cement and an adhesive backing. If you visit Morocco, you will see these Moroccan mosaics covering water fountains, interior walls, mosques, tombs, among others. Have you booked a ticket yet?